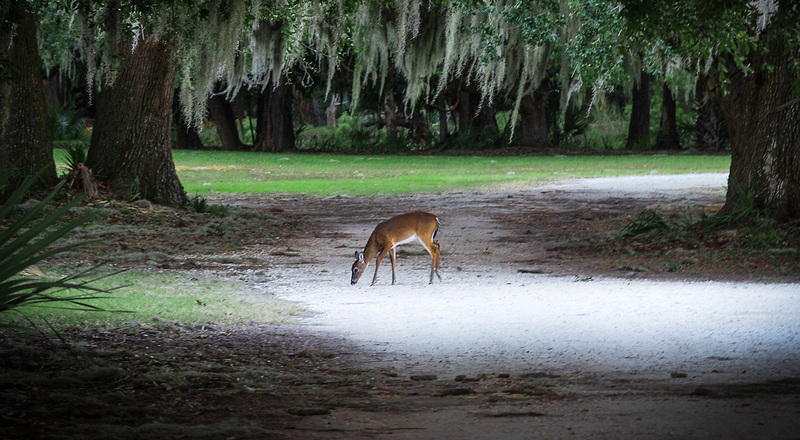 The white-tailed deer (Odocoileus virginianus) is a commonly observed mammal on St. Catherines Island. This species occupies a wide variety of habitats, and benefits from a mosaic of wetlands, forests, fields and early successional habitats. There are 11 subspecies of this species in the Southeast U.S., including four specifically confined to barrier islands of Georgia (Sapelo Island and Blackbeard Island) and South Carolina. These subspecies appear to adapt to the feast and famine conditions common to areas with restricted movement and limited habitat diversity—characteristics that are expressed both morphologically and physiologically. White-tailed deer are an opportunistic herbivore: consuming forbs, grasses, fungi, flowers and browsing twigs, shoots, and leaves. They browse a wide range of woody species, especially new shoots and saplings. 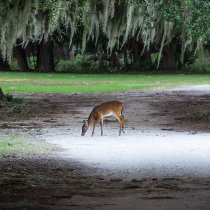 Their impact on the woody species on Georgia barrier islands has been well documented on Cumberland Island and Little St. Simons Island. Hard mast remains a critical component of their fall and winter diet, with mast determining weight, antler characteristics, and reproduction. White-tailed deer occur at densities from 5.8/km2 to 11.6/km2. The Land Manager’s Guide to Mammals of the South, Edited by M.K. Trani, W.M. Ford, and B.R. Chapman. 2007. The Nature Conservancy, Southeastern Region, Durham, North Carolina, USA. 546 pages. 20: Bratton, S.P. and E.A. Kramer. 1993. Recovery of live oak sprouts after release from browsing on Cumberland Island National Seashore, Georgia, pp. 47-57 In C. Andrew 11 Cole and Kent Turner [eds. ], Barrier Island Ecology of the Mid-Atlantic Coast: A Symposium, U.S. National Park Service Technical Report NPS/SERCAHA/NRTR -93/04. A Strategic Conservation Plan for St. Catherines Island, Georgia, Prepared for the St. Catherine’s Island Foundation – Robert D. Sutter, L. Gregory Low, Sara J. Gottlieb, June 2013.